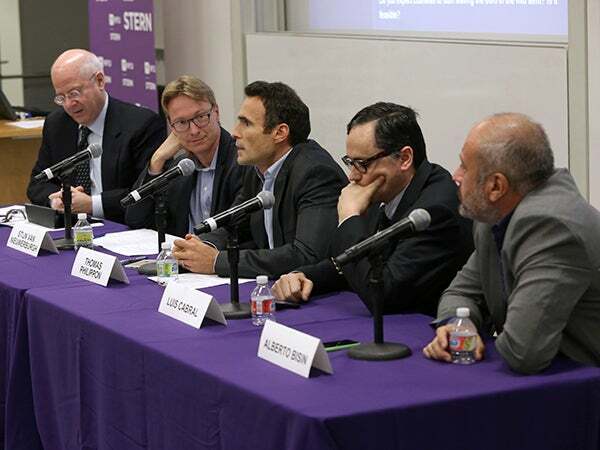 The NYU Stern Center for Global Economy and Business hosted a panel discussion on "The Future of the European Monetary Union," featuring Professors Alberto Bisin, Luis Cabral, Thomas Philippon and Stijn Van Nieuwerburgh. The panelists offered introductory remarks outlining many challenges facing the EMU and the European Union today – including economic rigidities, fiscal burdens, an incomplete banking union and the current migrant crisis across Europe. They also welcomed questions from the audience on topics such as euro-area enlargement, the links between banks and sovereigns, the Greek debt negotiations, external influences, long-term growth prospects and a range of political issues. To learn more and watch video from the event, please visit the Center’s website.